Thanks for getting things together. 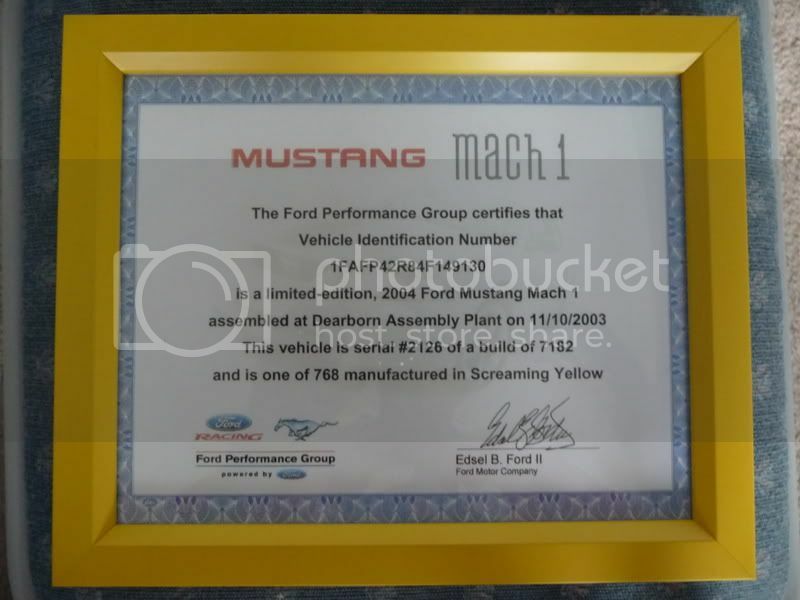 The Ford Performance Group is a great affliation for our group, and connects us formally with Ford. I look forward to leveraging our relationship as we continue to plan for the 45th Anniversary bash in Alabama next year. Thanks so much to Dave for all of his work. If you notice on the club page on FPGs site, you'll see the new Registry logo (betcha missed that one). We'll be seeing it on future items. He's been working on that very hard as well. I've had mine on order for a few weeks, so hopefully I'll see it soon. My numbers: #13 of 9652 production Machs built in 2003. Thanks also to John Clor, and Tony Alonso and the people at SVT/FPG who worked tirelessly behind the scenes to make this bird fly. Thanks Dave, this is my belated birthday gift to myself. It would be nice if both names on there, but you have a member number, and not sure if you put your VIN in or not, but they (FORD) should be able to search the database I sent them. did it come in that frame or did u find one and color match it?? so I filled out the form on this site. Being that my Mach 1 has a "rebuilt" title, is it still eligible? I wonder if Project "R" could be an "honorary Cobra" once it's done. I know,that would be a real stretch. Frames are NOT included. You will have to supply your own. Search the Database using your %Name% for wildcards, it might be in there, but just go missed on the list. I am missing some recent ones on the pages, but should be in the database. Would find all references to "DORAN" in the database. I found the frame at ArtCo by where I live. It is an 8X10 and they come in all colors. The price was $15. if you are NOT in our Owners list, then you won't be in theirs, They have our database. Unless they didn't search it correctly. Check ours and let me know. I know we had a few months were it wasn't updating correctly. Unfortunately, you will have to wait for the update with Ford (next update, probably on/around Nov. 1) sorry. I am on the list. The guy said that he could only search it by last name, not VIN or M1R number, etc. Not sure he knew what he was doing. I guess that I will just go ahead and order and forget the discount. Try to call them one more time and ask them to search again. If they can't find you, send me a PM. **** cool! Thanks Dave and M1R Staff! If it was a red truck your house would be on fire. BTW.....Since im just now registering my vehicle when am I able to order my certificate? Can I call them on monday?